1. 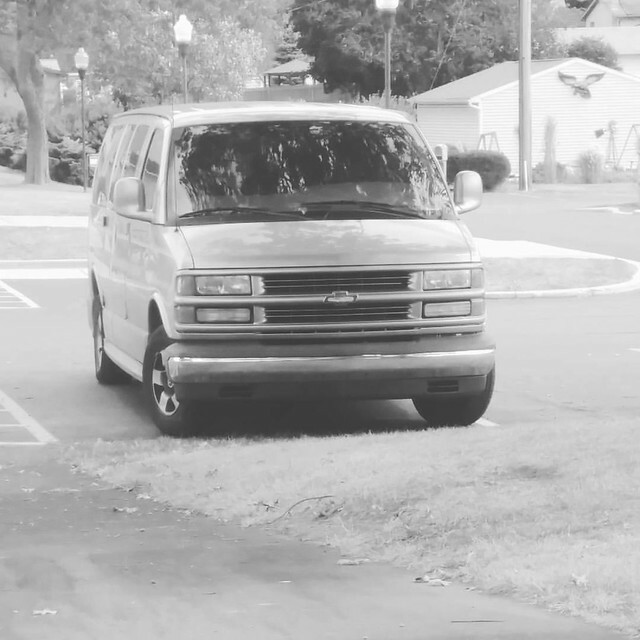 So I drive this great big Chevy Van because I can get lots of kids and stuff into it. I usually park very far away from the door so that I have lots of room to park and maneuver and so I don't have to back up. Backing up in this thing is... challenging. So last week I got to my destination and my little voice was saying, "We're here! Now go park way over there so that we can get out without any problems." But my mind thought, "But there's a space right there by the door and I won't have to go far to carry all my stuff into the building and it will be better for my sore knee!" So I ignored the little voice and I parked right by the door. As luck would have it, the girls forgot their lunch that day so we were going to have to make an unexpected trip to the local McDonald's for a fast quick lunch. As we walked out to the van the little voice said again, "You should keep Izzy out here to tell you if you're getting to close to another car!" But my mind thought, "That's ridiculous. It's cold outside and I have tons of room. There's nothing behind me. I've been driving for decades. I should be able to do this. So I started backing out. I kept checking my mirrors and didn't see anything directly behind me. So I started concentrating on the extra long van beside me - because most of my homeschool friends drive really big vans. I wanted to make sure I didn't clip the end of it as was making my slow maneuver out of the parking space. I still checked my mirrors and didn' t see anything. But I soon felt it - BUMP! Insurance info was given, calls were made and apologies were sincerely conveyed. But the lesson learned is DON'T IGNORE THAT LITTLE VOICE!!! 2. I had a couple of science experiments to do in my class this week - but then we had a snow day so they weren't done. Instead, Rosie and I did them at home. This was one of them. Doesn't this look like a flower? 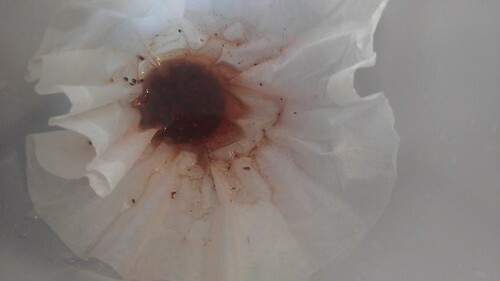 It's really a coffee filter full of tea illustrating the filtration of the kidneys for General Science. 3. Over the weekend I surveyed our backyard. Not a single blade of grass survived the winter. It looks just as bleak and destitute as it did last spring when we got the bright idea to try and plant grass seed. That was our third attempt too. So I talked it over with Mr. Pete and I think we've both had it. We are going to try to go with a grassless backyard! This is what I'm thinking about - what do you think? 4. So in the bulletin this week, they are advertising the special history of the harpsichord that will be used in our chamber music concert on April 15. It is built in the Flemish Tradition after Johannes Couchet c.1650 and it is beautiful. 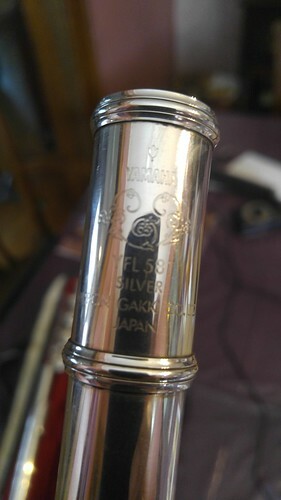 My flute has a history too - but not quite as illustrious. I started out my flute career on a regular Bundy flute. In high school my mom upgraded me to an Armstrong Flute. When Mr. Pete and I moved to Ohio he was working in a music store and I was able to get a deal on a nice Yamaha. That's what I play today. My flute teacher, Anita Exline, was always looking to play on the nicest instrument she could afford. 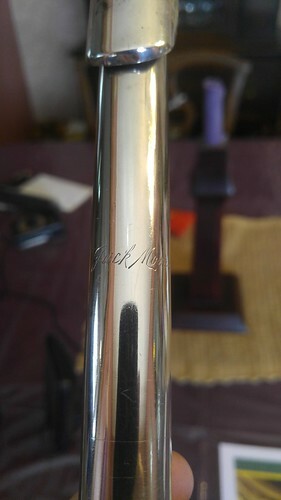 She went all out one year and bought a Jack Moore flute. She was very excited about it and even let me play it a time or two. However, one day she was getting into her vehicle and absentmindedly put her flute on the roof while she fumbled with her keys and put things inside of her car. She drove away with her flute on top of the car and you can guess the rest. When she went back to look for it she found it in the middle of the road demolished. The head joint was as flat as a pancake and the rest of the flute was completely destroyed. She was able to turn it all over to her insurance company. Luckily they gave her enough money that she was able to purchase a brand new golden Yamaha flute. That was the one she continued to play until the end of her life. Mr. Pete was intrigued with her flattened head joint. When the insurance company gave it back he asked Anita for it and she gave it to him. Playing with heat and his tools in his shop he was able to bring it back to shape and give it new life and tone! Anita didn't want it, but she was amazed at how he was able to resurrect it and she loved its sound. She let him keep it and he gave it to me. 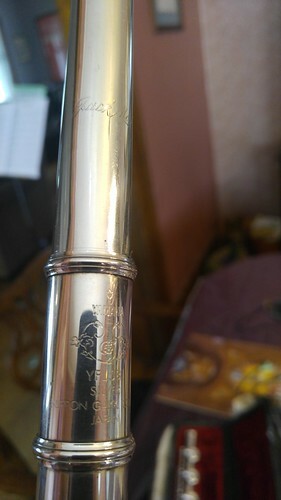 That is the headjoint I have on my flute. At my concert I will be playing my Frankenflute- the Jack Moore headjoint with a Yamaha body. Not as nice sounding as a Flemish Harpsichord I suppose- but a true story nonetheless. 5. Tomorrow Mr. Pete and Rosie go to the annual Father/Daughter dance. Since it is a 50's sock up, Rosie is going all out! I even got her a poodle skirt. 6. We heard two wonderful talks on the film, The Passion of the Christ. The speaker mentioned that a lot of the things in the film that were not from the gospels came from the visions of a mystic nun named Ann Catherine Emmerich. I hope to be able to read her book next week during Holy Week. Homeschool Parent's Guide to Grades, Credits and Transcripts. You need to update your transcript each year of high school anyway. Why not now? It's time to start thinking about grades, credits, and transcripts again. You can get it done quickly and then feel great about your accomplishment! Check out this FREE online replay of the webinar "A Homeschool Parent's Guide to Grades, Credits, and Transcripts."